Your attendance in worship is very encouraging to us, and we want you to know that you are welcome here. We understand that people have various experiences in religious practices, and come from many different backgrounds. With this in mind, we want to offer a little view into how we structure our assembly at Main Street. It is our hope that the following will be helpful to you. Upon your arrival and entrance into our building, you will be warmly greeted by individuals who will welcome you with a bright smile, a handshake and provide you with a copy of our current bulletin and a visitor handout that will tell you about the congregation. You will also immediately "run into" a group of our members talking and enjoying each other's company. Whether it is brothers and sisters catching up on each others' lives, someone asking our preacher a question about a sermon or bible class, or members getting to know a new individual or family at services, the minutes leading up to and immediately following our bible classes and worship services are always warm, welcoming, and encouraging. You will quickly notice that our members come from all walks of life. You will meet Christians who are drawing social security, see babies still in diapers, notice young singles, as well as middle-aged couples. We believe that you will find the kind of unity which is desired by our Lord (John 17:20-21; I Corinthians 12:12-27). 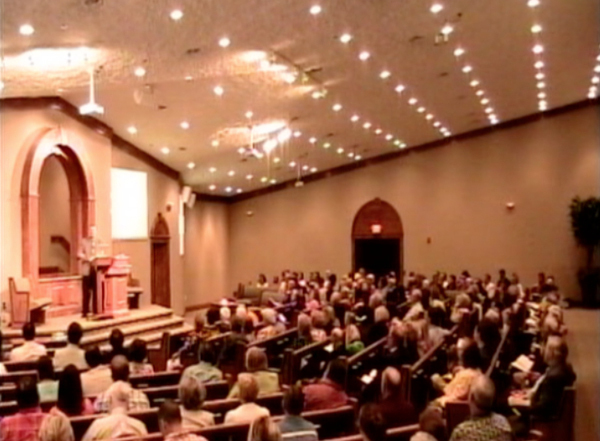 Our congregation is widely known for its love of people. 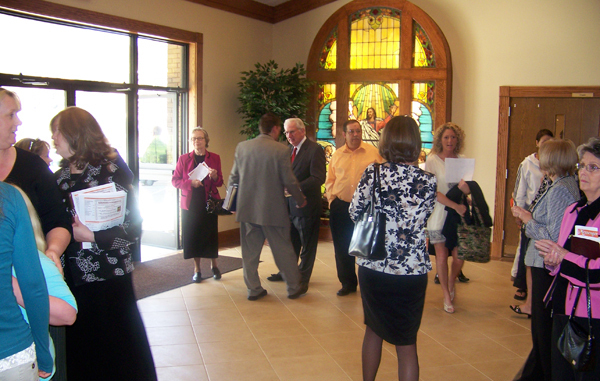 While attending one of our services, you will quickly notice that we enjoy meeting new people. We're going to introduce ourselves to you ... you'll have to shake some hands and exchange some "how do you do's" while you're here with us. We sincerely hope you understand. Crying babies, cell phones, pagers and PDAs are all a wonderful part of our culture. We understand when babies cry or when someone accidentally forgets to turn off a cell phone or other electronic devices. Although it is a little embarrassing for the person who forgets, we will never belittle you for such a thing happening in our assembly, and we would never want you to feel too embarrassed to return. The goal of our assembly is to encourage one another, honor God in our united voice through worship, and to be equipped by the Bible for better service in God's kingdom. Though we make every effort to communicate clearly, sometimes, we cover information or use terms that may seem foreign to guests or those who are unfamiliar with Christianity. If you should have any questions about anything regarding our faith, practices or programs, please ask the preacher or one of our elders, and we will be sure to assist you. As you enter into the auditorium you will see many rows of pews for the worshippers. There are no reserved seats, so please feel free to sit anywhere you choose. If you arrive at or near the start time of our service, you may be greeted as you enter the auditorium, by one of our ushers. They will offer to assist you in finding a comfortable location to sit. You will discover our music is done without any musical instrument accompaniments, solos, choirs, or praise teams. We seek to worship God according to the New Testament pattern found in Colossians 3:16, and since the New Testament only authorizes singing, that's what we choose to do. This type of singing is called, "a cappella", or without musical accompaniment. It is our desire to pattern our worship service after the first century Christians. Those Christians chose not to use mechanical instruments of music for their worship and neither do we. After a song or two there will be an opening scripture reading and prayer. 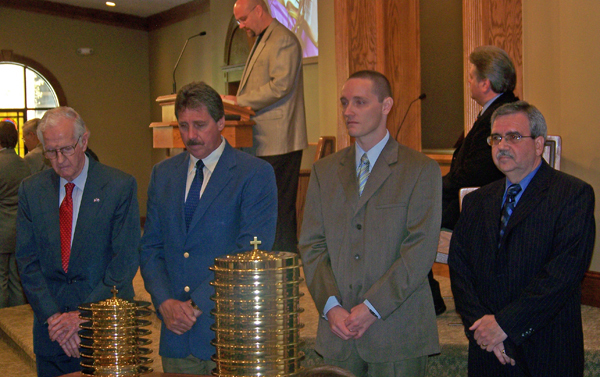 The scripture reading is usually chosen by our speaker, and will have some connection to the lesson of the hour. The prayer that follows will focus on the many special needs and concerns that we have been made aware of, as well as asking a blessing on our worship. We take the Lord's Supper or Communion every Sunday. As we have previously mentioned, it is our desire for our worship services to be patterned after the church of the First Century, and we find this example in such passages as Acts 20:7. The Lord's supper was first established by Jesus as he met with His Apostles. It is a memorial for His death. Jesus took unleavened bread and told His Apostles that this represented His body. He then took the fruit of the vine and said that this represented His blood. He told his Apostles that as often as they ate the bread and drank of the cup, it would show his death until He comes again (1 Corinthians 11.23-26). We will take a few minutes to collect money from the members of the congregation. As a matter of convenience, this will normally be done at the conclusion of the communion service. This responsibility rests solely with the members of the Main Street Congregation. (1 Corinthians 16:1-2). As a visitor we do not expect you to provide any contribution. Simply pass the tray to the next person and don’t feel compelled to put anything into the tray. Our preacher’s only title is minister, or evangelist. He won't be referred to as Pastor or Reverend, because such titles are not found in the New Testament in the context of a preacher. He won't be wearing any ecclesiastical costume or robes that will set him apart from the rest of us. The sermon will be about 30 minutes long and will be totally Bible-based. We invite and encourage you to open your Bibles and follow along. Our minister and leadership believe strongly in maintaining the practice established by Jesus' Apostles in the Church of the 1st Century. Preaching has a prominent place in our worship. Our evangelist presents the Bible as it is given to mankind... in a practical and relevant manner. 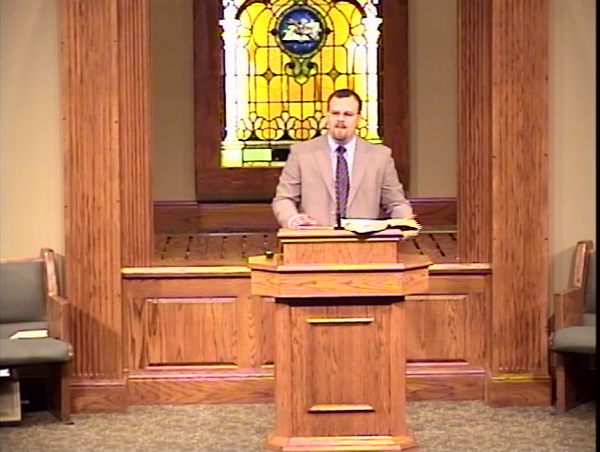 While preaching, Josh commonly uses the N.K.J.V. (New King James Version) rather than other versions that use an "Old English" style of wording. Every worship service includes a sermon that is Biblically responsible and relevant for today's culture. 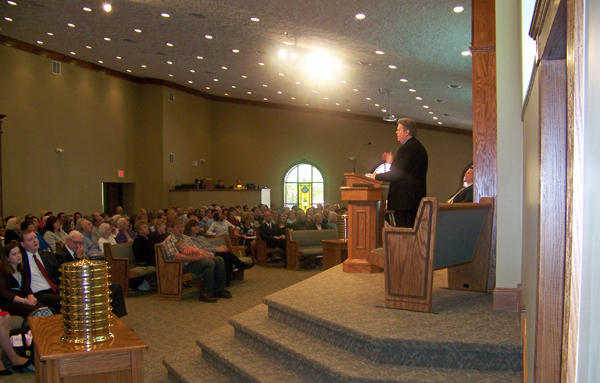 Our preacher makes sermon outlines available each week, which are located in the foyer as you enter the auditorium. These outlines are a great way to record notes of interest during the sermon for later study. They also offer the additional bonus of helping to keep "in touch" with the messenger. Nearly every message presented at Main Street includes this type of note taking interaction. 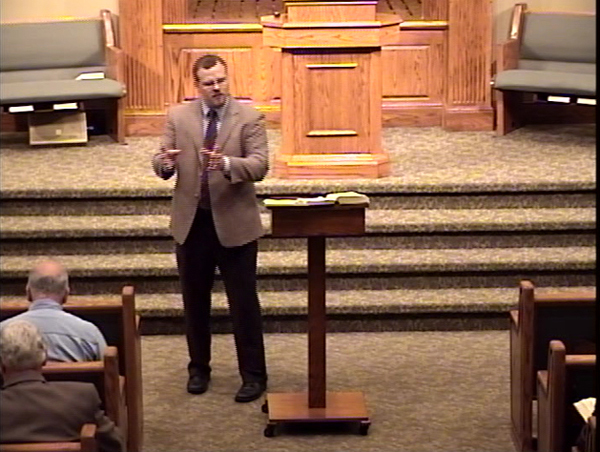 At the conclusion of the sermon, our preacher will offer a time of response to the message. You will find this done in a simple and humble way without any embarrassing displays. No one will try to "drag" you down the isle, or coherse you in any way. We simply ask that those needing to give their lives to Christ, and those needing prayer, come forward during the invitation song, and take a seat on the front pew. The preacher will be waiting to receive anyone who comes forward and speak with them about their need. For many, this will be the first opportunity to publicly express faith in Christ Jesus as their Savior and Lord. By attending a service at Main Street you will likely see someone make this decision of faith and be baptized in front of the entire crowd of worshippers. We have a clean, heated baptistery that is ready at all times for just such a decision of faith. Anyone who has questions about what it means to become a Christian, or about Christianity in general, are encouraged to speak with our minister, or one of our Elders.